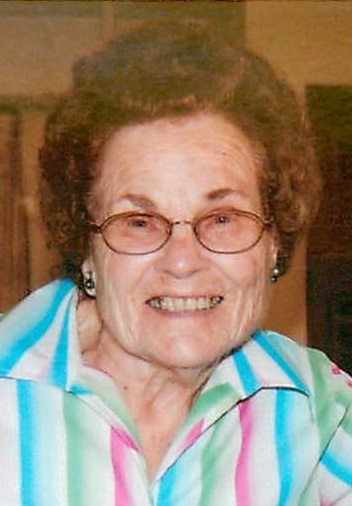 Vida Violet (Elliott) Boman passed away on Tuesday, November 27, 2018, at the Belleville Health Care Center with her family by her side at the age of 93 years, 10 months and 7 days. Vida was born on January 20, 1925, on the family farm near Republic, Kan., to George and Violet Elliott, and she graduated from Republic High School in 1942. She married the love of her life, Wallace Boman, on June 27, 1943. They raised two sons, Wallace “Sonny” and David, and six daughters, Barbara, Nancy, Vickie, Pamela, Jan and Sheila. Vida devoted her life to her faith, family and working with her hands. She was a lifelong member of the United Methodist Church in Republic, Kan., where she served as custodian for 50 years. Vida had a passion for sewing, gardening, crafts and the piano. She enjoyed the sounds of nature – especially the red birds. She was most proud of her role as a loving wife, mother, grandmother and friend. Vida was preceded in death by her husband Wallace; great granddaughter Kiley Boman; parents George and Violet Elliott; sisters Lucille, Evelyn, Ruth, Gertrude, Dorothy; brothers Melvin Kent, Irving, George, Howard and LeeRoy. She is survived by her sister, Verlene Veteto of Courtland, Kan; eight children; Barbara Hurley and friend Leon of Hays, Kan., Nancy (Larry) Larson of Junction City, Kan., Vickie (Paul) Osborne of Formoso, Kan., Wallace “Sonny” (Joyce) Boman of Topeka, Kan., Pamela (Ron) Schmit of Wichta, Kan., David (Carol) Boman of Columbus, Neb., Jan (Tim) Davis of Belleville, Kan., Sheila (Leo) Blanding of Courtland, Kansas. Grandchildren Kirk Larson, Rod Larson, Robyn Larson-Brumfield, Lisa Hurley-Sander, Jeffery “Ty” Hurley, Chad Osborne, Bret Osborne, Ashley Boman-Worrell, Brent Boman, Scott Boman, Ryan Boman, Stacy Boman-Shelsta, Renee Boman-Stull, Tonya Boman-Paitz, Erika Davis-Ewert, Monika Davis-Kruse, Keith Blanding, Kameron Blanding and Kayla Blanding. 41 great-grandchildren, two great-great grandchildren, and three sisters-in-law, Bonnie Elliott of Belleville, Kan., Florence Elliott of Hays, Kan., Eleanor Elliott of Redding, Calif.; many nieces, nephews, and other relatives and friends. Visitation will be held at Tibbetts-Fischer Funeral Home in Belleville on Saturday, December 1st from 1:00pm to 5:00pm and Sunday, December 2nd, 2018, from 1:00 pm to 8:00 pm, with family greeting friends from 5:00 pm to 7:00 pm. Funeral Services will be held at the United Methodist Church in Republic, on Monday, December 3rd, 2018, at 10:30 am, with interment to follow at Lake Cemetery in rural Republic. Memorials may be made to the Republic Methodist Church or the Family’s Choice. Tibbetts-Fischer Funeral Home assisted the Boman family with these arrangements.